Finding a CNY outfit may be easy, but getting one that looks great and will keep you staying lucky for the rest of the year definitely isn’t. Who doesn’t want an outfit ensemble that will give you the best of both worlds? Read on to find out what your lucky colours are this year based on your Chinese zodiac so you can step into 2019 on an auspicious note and “huat” away! Born in the year of Rat? You’re smart, successful and able to think on your feet. Always ready to take on the unexpected, it’s time for you to surprise everyone around you this CNY! Pull off a show-stopping look and unleash your femininity in your lucky colour carnation pink while keeping lady luck by your side! Not only are you intelligent and reliable, you’re a hardworking individual who never demand praises. Question is, why blend in when you are born to stand out? Pair your lucky colour with sophisticated colours like gold or red to channel a classy vibe and make your presence felt. Remember, don’t be afraid to receive compliments and gain recognition for your effort if you deserve it! The third of all Zodiac animals, tigers are courageous and love a good challenge or adventure in life. No matter how many obstacles come your way, you don’t give up. Ignite your fiery spirit in an outfit that’ll bring you luck and attract positive energy to take on the challenges ahead. Earnest with everything you do, your sincerity will shine through this year and you’re steadily moving towards your goal. You may be conservative and careful in your actions but a plain and routine lifestyle is just not for you. Spice things up and make your outfit exciting by playing around with a vibrant colour and different textures! This year, your resilience and independence will take you to great heights in your career. As one of the most revered animals, Dragons still yearn for support and love. At the end of the day, we’re all just human beings and we have emotions. So don’t feel pressurised to put up a strong front all the time! Show your soft side with a romantic yet elegant colour like lavender that is bound to dominate this whole summer season. During difficult times, you’re always the eye of the storm as you’re able to hold your ground and offer solutions with composure. More importantly, you know when is the right time to unwind and have fun! 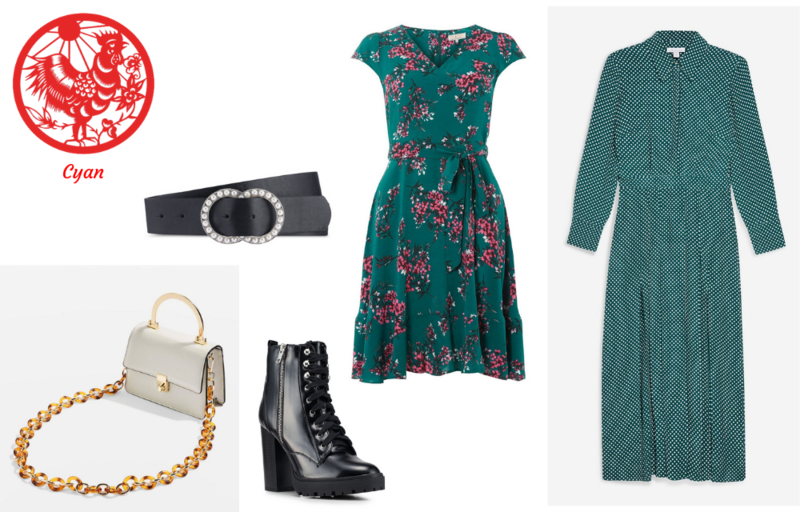 Here’s an outfit that’ll bring you luck and showcase your versatility at the same time without being predictable like your standard-issue black. Pair this neutral colour with a complementary pine green sports set for the ultimate stylish look without compromising comfort. Being the free-spirited individual that you are, you’re zestful and people see you as the life of the party. Continue to light up everyone’s lives and spread your positive energy this CNY by wearing a pop of red! We guarantee it is a sure-fire way to add flair to your outfits too! Despite your gentle nature, you are one of the strongest and most resilient zodiacs there are! But don’t see that as a weakness, rather embrace that softness that comes with your personality and flaunt it! By wearing key outfit pieces in your lucky colour, sky blue, you’ll be making new friends all year round with your lovely personality. Start this lunar year on a clean slate with pristine white garments that’ll grab everyone’s attention from a mile away! Use that time to prove that there are always two sides to a coin and that what others may see as a negative trait of yours can actually help out amazingly in certain situations! You are the perfectionist of the bunch, not only are you critical of yourself, but you also try your best to make sure that others aren’t making mistakes either! Your caring and responsible nature will shine through in shades of cyan this year as you get organized and unleash your true potential. Your zodiac animal is Man’s best friend for a reason; a dog’s most defining characteristic is their loyalty! Opt for deep blues to steer yourself away from worries and anxiety and you’ll be able to flourish in 2019. Don’t let anything stop you and just go for it! Welcome the lunar new year with flashes of bright, yellow outfit choices to match your warm, optimistic outlook on life! You know that life is best enjoyed when you live in the moment and there’s no need to change your ways now. Shine those positive vibes at those around you and we’ll all be in for a great year ahead!